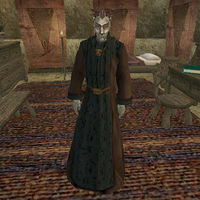 Vaval Selas is a Dunmer healer who works at the St. Olms Temple in Vivec (though oddly enough he is not a member of the Temple faction). There he sells ingredients, potions, and spells to all who need them. He is a restocking vendor of the following ingredients: Bittergreen Petals, Chokeweed, Gravedust, Rat Meat, Saltrice, Scrib Jelly and Small Kwama Egg.